At least three members here have expressed an interest in building a boat tail for their 2000 Honda Insights, so here are a few of my notes on what such a boat tail would look like. 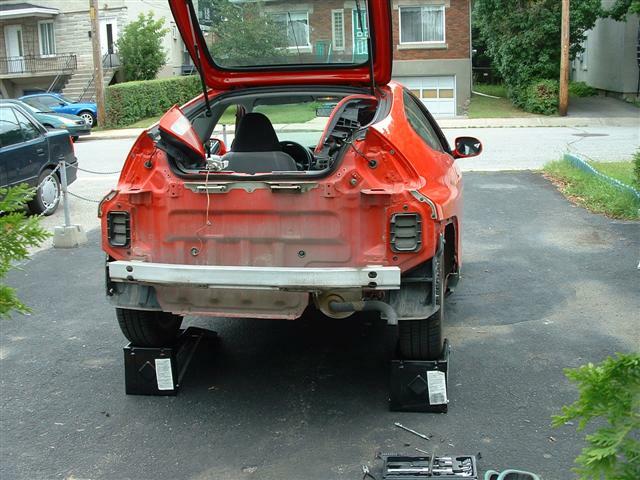 I started with the side-view image from the InsightCentral encyclopedia, and checked the existing angles of the car's rear end. It's about 8° in the vicinity of the antenna, 12° around the middle of the hatch glass, 14° for the rear third of the glass, and it could plausibly be 18° at the spoiler. Here's a picture where I extended the roof at 18° and the bottom of the rear bumper at 7°, and truncated where it is 15.5cm tall for the license plate. This results in a lengthening of 1.48m, making the car 5.42m long. For comparison, a 2010 Accord is 4.93m long, and a F150 short cab short bed is 5.41m long. The 18° and 7° angles are from EM conventional wisdom, which may be from Hucho's book. However, I won't believe it for certain until I see it in a wind tunnel or on a prototype. Particularly, what's the relationship between the angle of the bottom of the tail and Cd? The design of the top is easy, and the bottom is fairly straightforward, too. But what will the sides look like? How far forward will the tail extension need to start? The rear is rounded, and it's not clear exactly where flow becomes detached. Btw, the rear of the tail will be about .8m wide, which is almost large enough for stock tail light housings and a license plate, but I was really hoping to leave the stock tail lights where they are. My next step is to create a 3D model of the Insight, add a few different styles of boat tail, and see what happens in the SolidWorks FloWorks simulation. I found a program to convert a .JPG into a .DXF that SolidWorks can import as a sketch, and I made .DXF's of the top, side, and front views. I'll combine them into a model some time soon, and I'll make the files available if anyone is interested. The 7° from the underside of the car might be more of an issue. For this large of a taper, there has to be a large amount of air entering the stream under car, and then expand to fill the void created by the 7 degree taper. I hope your model shows that you have enough air volume to play with there. The stagnation point at the front of the car typically does not let that volume of air underneath, and thus could "starve" the taper and not expand fully, thus causing a partial vacuum and resultantly cause unwanted turbulence there. Hopefully the model will show if can expand at that rate on the bottom side or not. I also wrote an email to my DOT safety inspector, and asked if there are any either State or Federal restrictions for the extended length of the tail on the back side of the car. If I spend that much time planning and building an extension, I want to be darn sure that all bases are covered legally, and not get a big surprise if I am pulled over for an adhoc inspection. I know for Class II motorcycles (3-wheeler's), there are very specific requirements for tail lights, reflectors, running lights, etc. Two things to keep in mind that might allow you to shorten that tail. Using a gently curved rather than a straight line allows the air flow to remain attached to a somewhat higher angle. Also, if the tail is tapered in from the sides as well as vertically, this reduces the volume of air that is needed to fill in under the tail. I believe it's supposed to be 2.5˚ max, no? You can also chop the end 1/3 off to keep it shorter and still retain roughly 90% of the benefit. The underside of the Flea's boat tail angled up to 6.5 degrees, and retained attached, if turbulent flow to the trailing edge, documented in the tuft testing video. I think basjoos is right: you can get away with steeper angles if you have adequate radii between sides/top and sides/bottom plus taper in both plan and profile. That would permit pressure recovery from the sides, and the bottom angle can be increased. My taper used predominantly straight lines on the top & sides, but if you arc gently through the taper, you can go up to 22 degrees and retain attached flow, says Mair (says Phil). The Insight has decent enough upstream aero that I bet it's possible on your cars. The challenge in construction for you guys will be the unusual cross-sectional shape at the rear of the car. You've got a lot more taper already in progress in the greenhouse at the transom than you do at the height of the rear wheels. If you'll go to "FLOW-IMAGES" Photo-Gallery-2,on the second row,you'll see your car in the wind tunnel under smoke. If you'll notice,the flow is actually separating a smigeon over the hatch. If I were to do a tail,I believe I'd decrease that angle a bit. 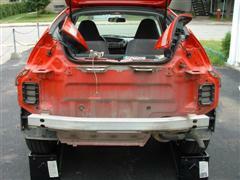 Darin put the Insight under the first template and you can see that the back of the car is a little too "fast." I agree with the others about gently curving the tail.It will be stronger.Because of that she can be lighter.And she'll aerodynamically superior. The template can also be used to help design the sides. I see what you mean about the slight separation over the hatch. Does anyone have a larger format picture of the template that I can use? I would like to overlay this template in a CAD file and generate a matrix of X-Y moves for this curvature. That way I can place the Insight sketch in the CAD and overlay the X-Y coordinates over the tail of the car to design a best-fit extension. Thanks for posting the underside angle of your extension. I will plan on going at least this steep in angle. The compound angular shape of hatch and by the wheel skirts will just make the design that much more interesting to work out. Similar to art. That's what Honda said too, and we ended up with a Cd of 0.25. I'm inclined to go all the way, since I think it will be departure angle and visibility, not overall length, that make the tail cumbersome to drive daily. The rear view mirror looks entirely through the upper hatch glass. The lower hatch glass is very helpful while reversing, but not useful on the highway. I'd be okay with blocking the view through the lower hatch glass, but a rear view camera would become almost required, adding to the cost of the project. I do see the widening gap between the hatch and the streamline. But isn't that normal, as the falling pressure after the apex causes streamlines to move farther apart? I can't really picture disorderly, reversed flow in the few cm between the illustrated streamline and the glass. And, this picture has me wondering where the stagnation point is on a stock car, and on one with a grille block. Do I want to send air over the car where there's more room for air, or under the car to fill the vacuum under the tail? Just an idea...remove the rear bumper facia to anchor your tailcone.